DISCLAIMER: this directory is made available to you by the NCBA. By using this directory, you take on the personal risk and liability of conducting business with the owner of the listing and do not hold NCBA liable to any fault that may occur with the business you have chosen. 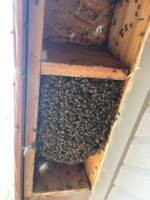 Listings that are advertising to do ‘structural hive removal’ should be insured and licensed to do the work. It is your responsibility to make sure their licensing and insurance is valid and current. Bee Squared is a 100 hive chemical-free apiary located in Berthoud, CO. We offer local clover and award-winning alfalfa/wildflower honey as well as orange blossom honey from California. 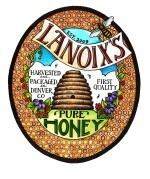 Our "Rose Honey from the Heart” is the only Good Food Award winning honey in Colorado! The Good Food Awards recognize both the exceptionally high quality of the finished product as well as the way in which we manage our bees. We also offer a Whiskey Barrel Aged honey that is a stunning combination of flavors: oak, smoke, whiskey and honey. Looking for honeycomb? We’ve got it! To Bee or Not To Bee is a family owned and operated business that focuses on providing first-rate beekeeping education and support to beekeepers of all experience levels. We sell beekeeping supplies that we feel provide the best value to our customers, including many locally made products. 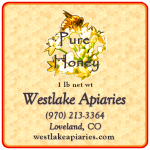 Short Business Description: Westlake Apiaries offers honey, beeswax, pollen and other products of the hive for sale. Westlake Apiaries offers honey, beeswax, pollen and other products of the hive for sale. In addition to bee products we offer swarm removal, pollination services and hive placement as well as mentoring programs for beekeepers. Westlake Apiaries also has a Queen Rearing program with queens for sale on a limited basis.